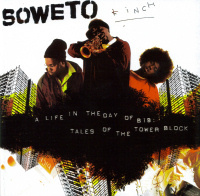 Ok, I won’t shy from it, I really do think Soweto Kinch is the most exciting thing to hit the mainstream of British jazz, to my mind, for at least the last six and a half years… (!) Ok, he’s probably not technically the best sax player in the world, he might not have the most imaginative lines in the universe and, yes, he has played the same set list for seemingly the last two years straight (at least, it seemed to be pretty much identical both times I caught him at the Coventry jazz festival in 2004 and ’06). However, I really don’t know of any band so truly vibrant and care-free, with such an over-riding sense of fun and humour… It’s like Soweto Kinch is in his own perfect world, and there’s nothing else really coming anywhere close. In the MainStream there’s the Oxbridge-style of F-ire collective outfits, the Leicester University-set of Arts Council wannabes, and then Soweto Kinch, whose band sounds like a well-matured student outfit, formed in the performing arts department of Wolverhampton Polytechnic (to point out that Kinch is actually himself a product of Oxbridge — having graduated from Oxford with a degree in Modern History — is to slightly miss the point). Anyway, whatever, this disc is really swinging, streets ahead of his Conversations with the Unseen, which I always found a bit cold and lifeless, on disc (Mwanji Ezana’s review). This is far heavier on the rapping side of things… But no “kitsch spirituality and ponderous moralizing”, this is full of pure humour; it’s basically Kinch doing whatever he likes and whatever he thinks will be a laugh on the day. There’s a sort of weird concept to the album (with some slightly out of place narration from Moira Stuart; as much of a legend as she probably is, I think she should probably stick to reading the news…), though the concept basically exists just to allow him to string the whole CD together into a single, cohesive whole. PS. A good pod-cast is here, plus other posts from Mwanji.